Elixir® Nickel Plated Steel Bass Strings with a NANOWEB Coating deliver a rich, rounded tone with greater clarity and heavier mid-range presence.Working closely with the global bass community, we asked 4000+ players what they needed from a bass string, and recruited 1000+ players for field trials to help improve the playability and our protective NANOWEB Coating. 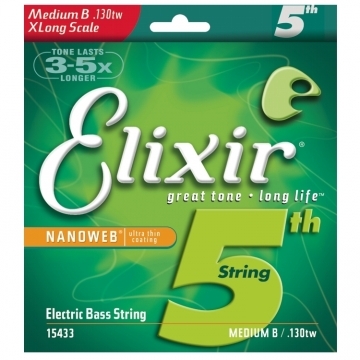 Inspired by our field trials, Elixir Strings entire line of round wound electric bass strings now benefits from a NANOWEB Coating made exclusively for bass guitar. With playing experience also enhanced by optimized string tension profiles, flexibility and feel, our Nickel Plated Steel Bass Strings deliver: Rich, rounded tone with greater clarity* Smooth, natural feel and reduced finger squeak Greater durability and response, even during hard-hitting attacks Longer tone life than any other bass string, uncoated or coated** Elixir Strings is the only coated string brand to protect the entire string with an ultra-thin coating, keeping gunk out of the gaps between the windings. With consistent performance from gig-to-gig, Elixir Nickel Plated Steel Bass Strings remove the hassle and expense of frequent string changes.